Looking for more ideas on how to spend your days in Paris? You must download our Free 4-Day Paris Itinerary! It’s often said that ‘Christmas is for kids’ and in Paris it’s no different. That’s why Santa Claus pops up in various locations around the city for children to visit him – the perfect holiday activity! Read all about where to find him in Paris. Located next to each other, these two upmarket, high-end department stores are home to Santa Claus every year for visits! At Galeries Lafayette during Christmas time, its ‘Children’s and Toys’ departments turning into Santa’s Grotto! With wooden and soft toys, creative and educational games, as well as dressing up, building world (Lego), a children’s bookshop and dolls – it’ll be sure to keep your kids entertained while you’re doing your Christmas shopping this year! La Grande Recré is a shop inside of Printemps Haussmann. Here, you can enjoy meeting Santa and getting your picture taken by the elf photographer! This small village on the East-side of Paris will make you feel like you’ve been transported to the South of France! It’s beautiful architecture and many restaurants and shops mean it’s on a must-see list for Paris. However, around Christmas time it’s even better! With fabulous Christmas lights and decorations, it hosts lots to see and do for families visiting Paris! A magical place to visit on a chilly winter’s day, complete with a reindeer, a caribou, elves and Santa Claus’ sleigh! In one of the walkways they also have funny pictures of Santa Claus in different scenarios, something directed towards adults to get into the Christmas spirit. The Christmas market near the Notre-Dame Cathedral is in a public garden called Square René Vivian, just between the Seine and the Notre-Dame Cathedral. It is the market to go to for your children to be able to meet (a French) Santa Claus and enjoy daily free entertainment! The market is open everyday from 10am until 8pm and on Friday, Saturday and Sundays until 9pm. Open as of December 12th and closing on December 23rd. For more info about the Christmas Markets in Paris – read here! The most beautiful avenue in the world is home to Paris’ incredible Christmas markets with over 180 stalls from the 11th of November until the 8th of January 2017. Here it’s possible to meet Santa Claus himself! He usually appears somewhere near the bottom of the avenue during the evenings between the 1st and 24th of December. He is however very rare and moves about often – so be on the lookout! 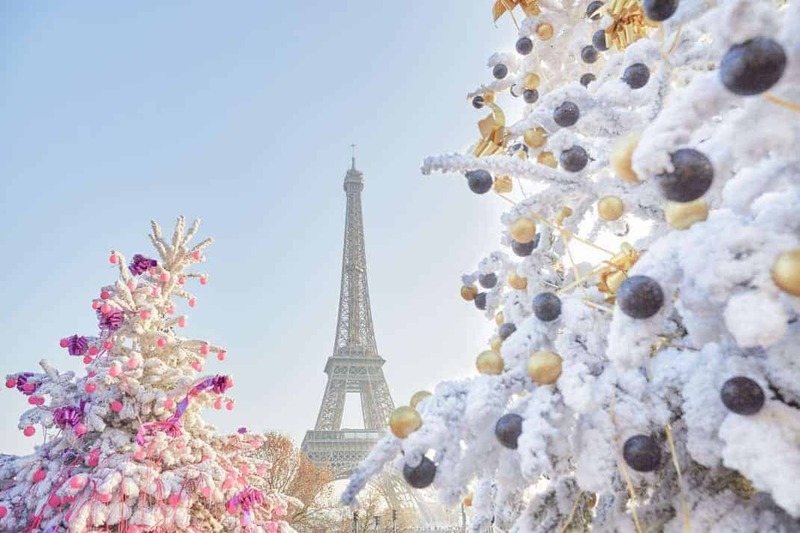 Find out more about the Champs-Élysées Christmas markets here! The December celebrations happen all over Paris – which includes even in the Paris Aquarium! Head over to see Santa Claus plunge into a big tank containing 600,000 litres of water! Old or young you can enjoy the magic of Santa Claus shown in a new light! This exceptional spectacle can be seen at 3pm between the 17th and 24th of December this year! See Santa swim with exotic fish and gain full access to the largest aquarium in Paris! Costs: Adult – €20.50, Children (3-12years) – €13, Children under 3 – Free!